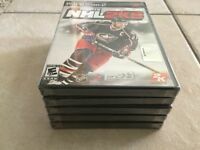 Gretzky NHL 2005 (Sony PlayStation 2, 2004) COMPLETE! $1 Combined Shipping! Gretzky NHL 2005 (Sony PlayStation 2, 2004) PS2 GAME BRAND NEW & FACTORY SEALED! Gretzky NHL 2005 for Playstation 2 PS2 Brand New! Factory Sealed! Superstar Wayne Gretzky represents his sport on PS2 in this hockey game from Sony. 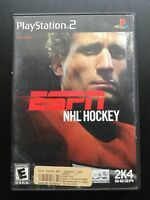 Although it pays special attention on its title star, the game is licensed by the NHL and NHLPA to include all the athletes and teams who would have played in the 2004-2005 season. Unlockable players include different versions of Wayne Gretzky, as he skated through his illustrious career with the Edmonton Oilers, the Los Angeles Kings, and finally the New York Rangers. Practice, Exhibition, Single Game, Tournament, Franchise, and Rivalry modes are all available. Gamers can also create and customize their own NHL players and team.